Five Sam Houston State University students are the recipients of scholarships funded by the local conservation group Tu-Mile Chapter of Quail Coalition. 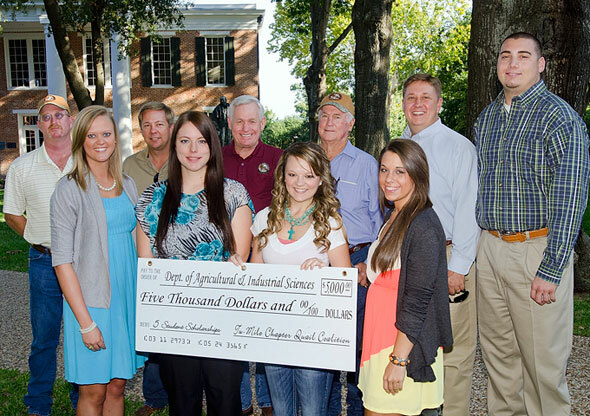 The scholarships are $1,000 each and benefit students within the Department of Agricultural and Industrial Sciences. The students are Hanna Eiland, a senior animal science major from Humble; Rachel Baker, a freshman interdisciplinary agriculture major from Dayton; Stephanie White, an agriculture graduate student from Corsicana who has received the scholarship three consecutive years; Haley Vrazel, an agriculture graduate student from Cameron; and Kyle Durr, a senior agriculture education major from Arlington. The Tu-Mile Chapter is the oldest quail conservation group in Texas. It was originally associated with the national Quail Unlimited organization until 2009 when the chapter joined other Texas chapters in forming Quail Coalition. The local chapter covers Walker and the surrounding counties. The source of revenue for the scholarships comes from the organization’s banquet—the group’s primary fundraising activity—held each August. In addition to providing funding the scholarships, the coalition holds shooting schools, works with habitat projects and promotes quail restoration.